Martin White, editor of The Shallow Review of Books, likes his life as he likes his work: shallow. Living in purposeful near-isolation in the middle of a crowded city, he keeps his relationships superficial and his life uncomplicated. His deliberate avoidance of social potholes prompts his colleagues to turn to him for assistance handling their own life and relationship baggage, which only strengthens his resolve never to allow any of it into his life. He’s pretty happy, albeit hollow and empty. Faced with a challenge by Rich, his more socially adept colleague, to ask Kasia out within a week or Rich will, Martin has no option but to open the doors to all the complexity of modern life and relationships as he re-emerges from the shadows. I write in a totally linear fashion. That is to say, when I sit down to write, I begin at the beginning and end at the end and try to include every aspect of the story that I think might work along the way even if my feeling is that I will probably cut it later. It’s both sane and paradoxical for me to write this way, but it’s the only way I know to get a solid story completed over 80,000+ words. In the first instance it is the solution to a problem. I have a hyper-active imagination, like many writers, I guess. And like many writers I am overly-indulgent of my flights of fancy far too often, resulting in a notable lack of structure in my life and in my projects. My early attempts at writing, and in fact, all subsequent attempts through a dozen half-written novels, was to go with the flow, let the story evolve and see what happened. What often happened unfortunately was that my characters led me on a thoroughly entertaining wild goose chase, replete with superfluous settings, extra characters and encounters that lent nothing to the story as a whole. It’s all well very modern to allow your art to be unchained, but if you’re me, it’s also a recipe for a disaster. I realised sooner or later that structure was needed and so structure was precisely what I applied. And to show how serious I was, I fired up Microsoft Excel and began to map my next story in that. I figured that as a guideline, if I wanted a credible work of full-length fiction, I’d have to create something with an extent of around 80,000 words. In order to keep the story moving along, I’d need to limit each scene, of which multiple can make up a chapter, to around 1250 words. And that meant I’d need at least 64 scenes to make up a story. Stucture! Don’t click the kill button on me just yet, I haven’t got to the creative part yet. Scenes were written in the order they came to my mind, randomly, without any care for each other. Each scene was described in its own spread sheet cell, in very great detail including whole conversations, actions, and anything that I thought was relevant. Over a period of a couple of weeks, during which my ambient radar was totally up and I actively spent time in the kinds of places where the kinds of people I wanted to write about were likely to be, I would compile a number of new ideas, steal new conversational snippets from those around me and fill in those scenes. Then, when I had enough of them, I’d begin to put them in order, literally printing them out, cutting them out, sticking them on a wall and doing it on my feet. This one before that one, merging two that seemed similar, and ultimately axing a few that just had no place in the story. Finally, happily, with a road map, I’d start to write. And with a slight dusting of irony, having that structure enabled me to wander off course just a little and see where a scene might take me, or approach a character interaction with no fixed idea of the content of their conversation other than a desired outcome. Suddenly, within a tighter brief, I was able to be creative. The result: my stories have beginnings, middles, ends and all the other things that my litter bin of abandoned novel attempts so painfully lacked, and I don’t personally feel, and trust this is reflected in my work, that I have been too mechanical about it. I love writing. I love the creative freedom it gives me and I love the self-indulgent power of inventing worlds and people to inhabit them and making them do stuff to each other all out of a bunch of random synapses in my brain. But I also love completing projects that I think are worthwhile. For me, there is no creativity without structure. What about you? About Colin Browne: I don't know where I'm from, but my best guess is that I'm South African though that's really a twist-of-fate rather than a birthright. Born in England, I moved to Belgium when I was two, South Africa when I was 12, Dubai when I was 25 and back to South Africa when I was 31. Nowadays, I call London home. I've done some fun stuff. I helped start a successful business in South Africa which I still part-own and I spent a lot of years before that writing articles for magazines around the world. Other authors talk about their awards and their accolades, so I suppose I ought to do that too. I won two white mice at a school tombola once. That's kind of it. My mum made me donate them to the school which is just as well because the cat would probably have eaten them anyway. He was a monster, that cat ... Other than that, I'm just a guy who loves telling stories and loves language. 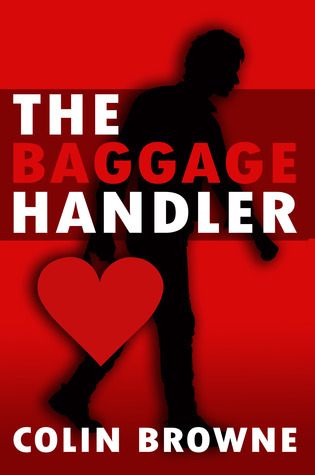 The Baggage Handler is my first novel and I am working on a second named The Ninth which will be available later this year. I also run the COLINISM blog at www.colinjbrowne.com which is blog of observational lessons from the world around me. This giveaway is open to international entries. Ends Saturday June 23rd 11:59pm ET. Winner announced Sunday June 24th. I would love to read THE BAGGAGE HANDLER thank you. It looks like a great read. Thanks for sharing about your writing process. The book sounds good. THE WINNER IS CAROL M!